I’m glad that recordings of Parry’s music have not dribbled to a halt after the interest shown in his music in 2018 when the centenary of his death was marked. Parry composed three piano trios and this disc brings us welcome recordings of two of them. There is a second trio, in B minor, which dates from 1884. The trios have been recorded previously: the Deakin Piano Trio set them down for Meridian but those recordings were made quite some time ago and I’m not sure how easy they are to come by nowadays: I’ve never heard them. So, this new disc is very welcome and it includes the first recording of the Third trio in a new edition by Jeremy Dibble. It is Prof Dibble, the go-to expert on Parry – and Stanford, for that matter – who has written the booklet note for this release and I shall draw on it for background information. Not long ago, I reviewed a pair of discs containing all three of Parry’s string quartets. The first two of those were very early works, dating from the 1860s and while I found them interesting, I discerned a notable step up in the level of assurance and accomplishment when it came to the Third Quartet (1878). The works recorded here post-date the first two string quartets and that’s probably why I found that the musical content on this present disc is stronger. 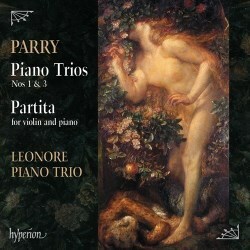 All three works on the Leonore Trio’s programme were first performed at the London home of Edward Dannreuther, who had become something of a mentor to Parry. Dannreuther, an accomplished pianist, regularly hosted and participated in chamber music concerts at his home. The First Piano Trio was first heard there in February 1890, with Dannreuther playing the piano. The first movement must have made a strong impression on those present – as it did on me. The opening is big and passionate and much of the music in the first movement carries on in that vein, though there are some very pleasing, more relaxed passages which provide an effective contrast. Parry ranges through different keys in a most effective manner and the movement sounds to me to have a good solid structure. It needs urgent, committed playing if it’s to make its full effect and that’s exactly what’s on display here. Jeremy Dibble sums up the second movement as “effervescent”. It’s nimbly played here and the members of the Leonore Trio are equally good in the more lyrical trio where there’s a good deal of cantabile string writing. The third movement, marked Adagio ma non troppo, features generous singing lines for the two stringed instruments, though that’s not to say that the pianist isn’t called upon to play warmly too. This is a deep movement and very lovely and it’s played with evident feeling here. The Trio ends with a rondo which is essentially vigorous – and in those passages the playing is suitably red-blooded – but there’s also a good deal of light and shade in both the music and the performance of it. This movement forms a very extrovert and upbeat conclusion to a fine work. The Third Piano Trio was begun in late 1889 and finished in February of the following year. It’s thus roughly contemporaneous with works such as Blest Pair of Sirens and the Third and Fourth symphonies, which had brought Parry significant acclaim. Jeremy Dibble says that in this work Parry “reveals a new-found assurance in the handling of lighter textures and more fluent instrumental interplay.” The textures in the first movement do indeed seem to me to be lighter than was the case in the companion work. However, what is even more striking, I think, is the strength of musical personality. There’s character and energy in the music and the movement has a seemingly endless forward momentum, interrupted only by a few short passages where the composer seems to draw breath. There follows a Capriccio movement which Jeremy Dibble describes as “a delicate intermezzo”. This movement also contains a warm, flowing central section. I turn to Prof Dibble again for his description of the Lento as “a solemn, ruminative essay”. Apparently, Parry originally conceived this movement as a lament. It’s not quite that, perhaps, but it’s a highly impressive composition – especially as performed here – and the music speaks eloquently. It seems to me that the writing for the three instruments is highly accomplished and convincing. Parry ends with a finale that’s marked Allegro con fuoco. This is full of confidence and good humour. It’s an outgoing, big-hearted movement which radiates assurance and optimism. Sadly, this Trio was Parry’s last major piece of chamber music. Jeremy Dibble believes that the reason may well be that Edward Dannreuther had to leave his London home, because the lease expired, shortly after hosting the first two performances of the Third Trio and his series of concerts came to an end. The Third Trio remained unpublished at Parry’s death and thereafter; the present performance uses a new edition by Jeremy Dibble. The Partita in D minor represents a revision of an earlier work: Parry’s Suite de pièces (1872-73). In 1886 Parry revised the work, adding an extra movement, the fifth of what were now six movements, and substituting an entirely new first movement. All but the first of the movements bear titles such as ‘Allemande’, ‘Sarabande’ and ‘Courante’ which indicate that Parry conceived the work as a series of dance movements inspired by dances of the baroque era. The result is most attractive. The opening Moderato has some of the characteristics of a French overture and, to my ears, has a Bachian feel. The ‘Allemande’ and ‘Sarabande’ movements are dignified in tone. Between them comes a deft, scherzo-like ‘Courante’, marked Presto. The ‘Sarabande’ is particularly appealing since most of the time the violinist uses the bottom two strings, imparting great warmth to his line. The concluding ‘Passepied en rondo’ has a jolly rondo subject which is subjected to some very effective variations which have a much more nineteenth-century feel to them. Benjamin Nabarro and Tim Horton play the Partita delightfully. This is a richly rewarding disc which I enjoyed from start to finish. The playing of the members of the Leonore Piano Trio is expert and highly committed. This is very worthwhile music anyway but they make the best possible case for it. The recorded sound is excellent, as are Jeremy Dibble’s notes. I believe that a recording of Parry’s Second Piano Trio will be forthcoming from these artists in due course. I look forward to that very much.